Naming: How do peregrines get their names? Question: How do peregrines get their names? Why do some have no names? Short Answer: It is the policy of the PA Game Commission not to name wild animals and birds, but it is inconvenient for nest monitors (humans) to discuss the birds they monitor without using names. Our tradition in Pittsburgh is described below. Within this tradition, naming suggestions from others are generally unwelcome. Adults: The primary nest monitor names the bird for his/her own convenience using these two rules. If the peregrine was named at banding (some states do name them), that name is preferred. Otherwise the primary monitor names the bird. Nestlings/ fledglings: The primary nest monitor assigns the juveniles’ names. Prior to 2016 juvenile names were based on the colored tape on the silver USFW band on the nestling’s right leg. All solo birds were thus named Silver. Nowadays Cathedral of Learning nestlings are named with the nest letter (C for Cathedral of Learning) + hatch number. For example, C1. Beginning in 2017, Gulf Tower / Downtown nestlings are named G + hatch number. For example, G1 through G3. Note that when a bird grows up and nests, local monitors may choose a new name if they wish. The vast majority of peregrine falcons have no names. Peregrines only receive names (from humans) when they hang out near people and do something that distinguishes them as individuals. Naming of wild animals is a sensitive issue, especially for scientists. On the one hand naming a peregrine might give people the impression that it’s tame or a pet – which it isn’t. On the other hand it’s unwieldy to constantly refer to a known individual bird as “the adult female peregrine at Gulf Tower” instead of “Dori.” So the peregrines who live near people usually end up with names. Some birds are named when they’re banded because the bands make them identifiable. Whether they are given names at that point is up to the state agency in charge of wild birds. Some places, such as Ohio and Wisconsin, name their peregrine chicks. Pennsylvania takes the scientific view and does not. If a peregrine is not named as a chick, it soon earns a name if it chooses to nest near people. Those who watch the bird want to talk about it and are quickly frustrated by having to refer to it in vague terms, so they give it a name. There are sometimes complications. If the peregrine is banded it might have been named as a chick. Should the observers wait until they read the bands to learn his name? If it takes months to get a good read, what should they call him in the meantime? When there are several names and a lot of people are involved how will they decide? Rochester, New York used an online poll to pick the name of their newest female peregrine. 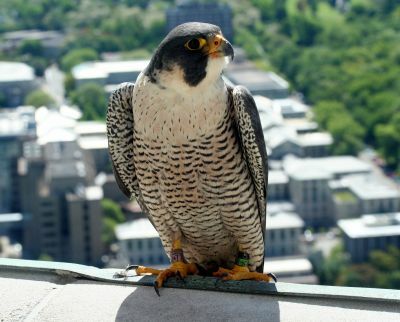 So how did Pittsburgh’s peregrines get their names? Dori, the current adult female in Downtown Pittsburgh as of March 2010, has more names than most peregrines. She was named Mary Cleo at banding and was given the nesting name, Dori (meaning wish), by her fans at Make-A-Wish whose offices are near the Gulf Tower nest. This gives her a long name like a pedigree: Dori Mary Cleo. Hope, the adult female at the Cathedral of Learning, was not named when she hatched at the Benjamin Harrison Lift Bridge in Hopewell, Virginia in 2008. When she began nesting in the Pittsburgh area she was nicknamed Hope for her birthplace. Terzo, the adult male at the Cathedral of Learning, was not named when he was banded in Cincinnati, Ohio in 2013. He’s the third male peregrine to nest at the Cathedral of Learning so he was named Terzo — which means “third” in Italian. Tasha, the adult female at the Gulf Tower -2010, was unnamed when she first arrived. The female she replaced had been named Natasha so Tasha inherited part of her name when she inherited her nest. E2, the adult male at the University of Pittsburgh, was born at the Gulf Tower. When Karen and I first recognized that he’d arrived at Pitt, we saw that he was banded and figured he probably already had a name. We could not read his bands and waited a while to find out but the days of waiting turned to weeks – and months – so we gave him a temporary name, E2, because his predecessor was Erie. When we found out where he was born the name stuck because he was not named when banded. And he truly is Erie the Second. Dorothy, the adult female at University of Pittsburgh, was born in Wisconsin where they name their birds at banding. Dorothy was born on the Firstar Building and named for the parking lot attendant who watched her every day.